Chemicals Blog: Insights and opinions on the latest trends in the chemical industry. In uncertain times, chemical companies need to think carefully about how they manage innovation. Why? Because in periods of slow or stagnating economic growth, innovation has been critical to helping chemical companies differentiate themselves and grow. That’s a key finding from Accenture’s recent analysis of more 100 chemical companies1 covering all chemical segments and business models. As illustrated in Figure 1, we observed that high-performing companies—those that significantly outperform their peers2—account for a higher share of research and development (R&D). Additionally, R&D spend for these companies slightly increased as a share of revenue from 2014 to 2015. The causes of 2015’s revenue declines—including stagnating mature markets, the economic slowdown in China and strong currency effects—could not be entirely overcome through innovation. However, high-performing companies managed revenue growth on average while the low performers faced significant decreases. 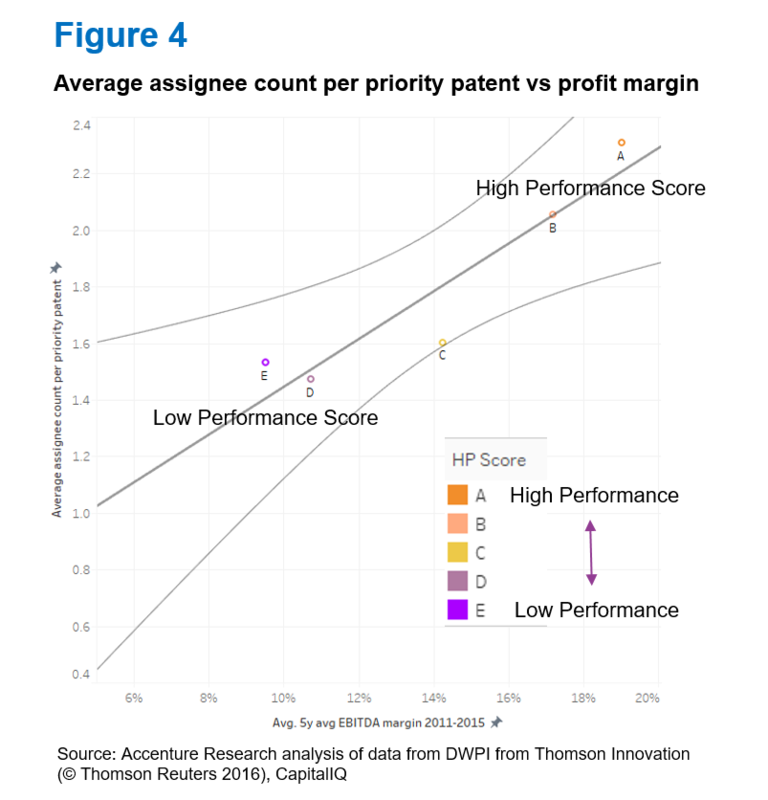 Finally, we found that high performers also had a stronger technology factor (or “TechFactor”), which represents the relative importance (measured by citation) of a company’s published patents in the past five years relative to the number of filed priority patents. Assuming chemical companies spent an average of three percent of revenue on R&D, the industry invested approximately US$120 billion in R&D in 2015.3 Our Innovation Quadrant (Figure 2), which helps us monitor how effective high performers invest their funds, visualizes R&D as a share of revenue versus each company’s innovation impact. 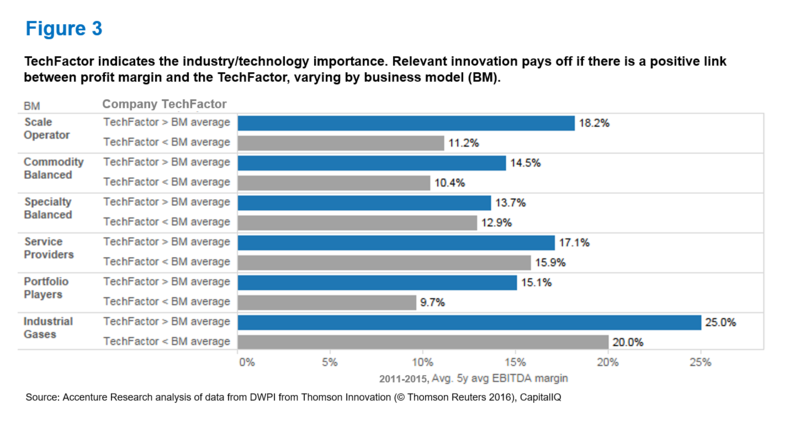 Innovation impact and relevance is determined by the TechFactor defined above. Me Too’s: Companies lacking R&D focus. Wannabes: Includes two types of companies—those with R&D spending above the peer average who are growing R&D spend as they aspire to being R&D “Giants,” and those who lag in the ability to improve R&D effectiveness and efficiency. R&D Giants: Large players that are leading and shaping the market with their innovations. Creative Stars: Companies achieving high impact in the industry without large R&D spend. 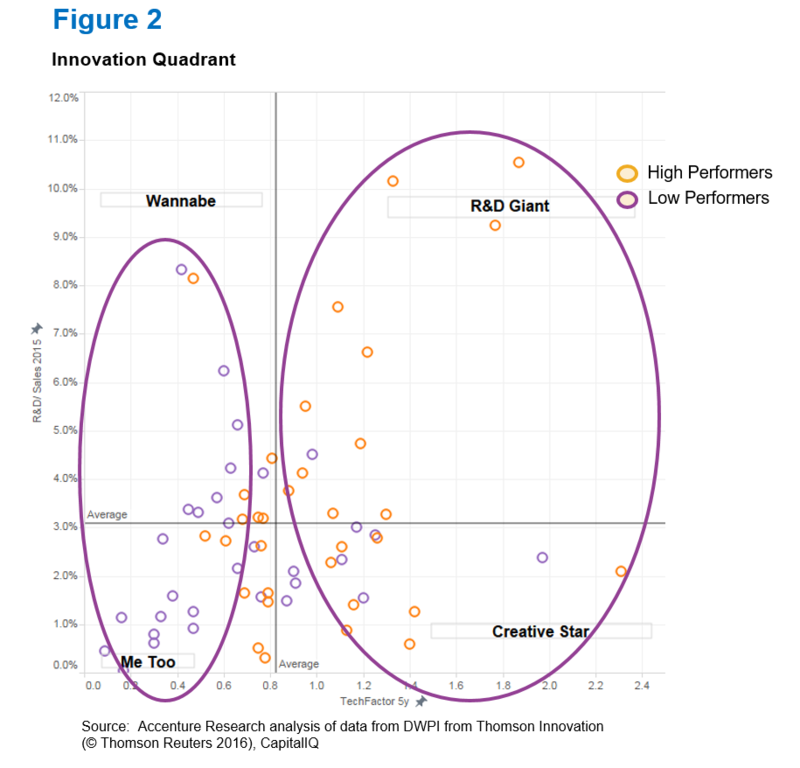 High performers are primarily located in the “R&D Giant” or “Creative Stars” segments. Low performers tend to be in the “Wannabe” category—companies that are spending on R&D, but not necessarily seeing significant research results, as gauged by their patents. Thus, it appears that the effectiveness of R&D is not simply a matter of spending. Instead, it is related to spending wisely, with a strict strategic focus on the innovations that will likely have the highest impact and value add. Accenture’s 2016 Chemical Industry Vision4 talks about how companies can benefit from connected innovation. A company’s number of patent assignees is an indicator of collaboration, and linking the number of patent assignees to high performers shows interesting results (Figure 4). High performers show a larger number of assignees per patent, indicating higher degrees of collaboration, on average. Collaboration can involve companies, universities/institutes and individual researchers who may be external experts or internal to an organization.Our previous blog on European chemicals references several collaborative research activities5within various customer industries like automotive and electronics in more detail. The findings of our patent analysis underscore the importance of solid R&D management. Digital tools can help companies transform the R&D function to make it highly effective and efficient. 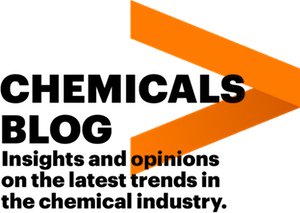 A separate Accenture analysis has explored how digital technologies can support all six key elements of a chemical innovation ecosystem6: ideation, organization, connectivity, skills, analytics and process. Innovation is an increasingly competitive field around the globe. Our analysis suggests that companies that want to win this race, and thus achieve higher performance, stand to benefit from a strong focus on R&D efficiency, effectiveness and collaboration. 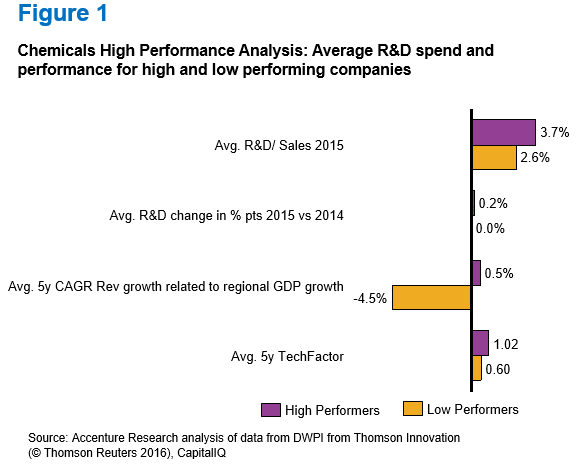 1 Accenture Research, High Performance Business in Chemicals analysis, 2016. 2 High Performers: Classified by Accenture as those companies performing significantly above peer average, based on 20 selected key performance indices, covering long-term and short-term financials, measures on operational excellence, growth and innovation. 4 Yankovitz, David, Bernd Kreutzer and Paul Bjacek. 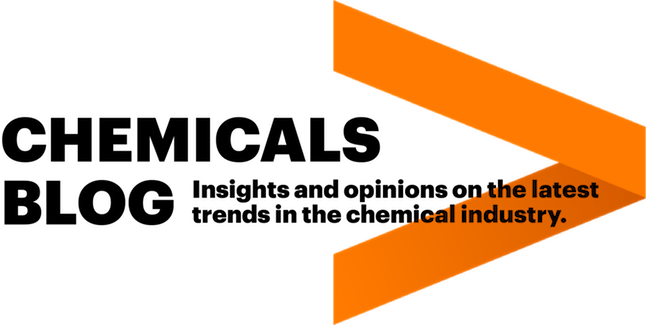 “Accenture Chemical Industry Vision 2016: New Realities, New Opportunities,” Accenture, 2016, https://www.accenture.com/us-en/insight-chemical-industry-vision-2016 (accessed November 1, 2016). 5 Walczyk, Karin and Paul Bjacek. “Reigniting growth in European chemicals: Sustainability and collaboration,” Accenture, 2016, https://www.accenture.com/us-en/blogs/blogs-reigniting-growth-european-chemicals (accessed December 7, 2016). 6 Elser, Bernd et al. “Digital disruption in the lab: The R&D of tomorrow,” Accenture, 2016, (accessed November 1, 2016).